The critical northern antebellum debate matched the rhetorical skills of Abraham Lincoln and Stephen A. Douglas in an historic argument over the future of slavery in a westward-expanding America. Two years later, an equally historic oratorical showdown between secessionists and Unionists in Georgia generated as much popular interest south of the Mason-Dixon line, and perhaps had an even more profound immediate effect on the future of the United States. With Abraham Lincoln's "Black Republican" triumph in the presidential election of 1860 came ardent secessionist sentiment in the South. But Unionists were equally zealous and while South Carolina--a bastion of Disunionism since 1832--seemed certain to secede; the other fourteen slave states were far from decided. In the deep South, the road to disunion depended much on the actions of Georgia, a veritable microcosm of the divided South and geographically in the middle of the Cotton South. If Georgia went for the Union, secessionist South Carolina could be isolated. So in November of 1860 all the eyes of Dixie turned to tiny Milledgeville, pre-war capital of Georgia, for a legislative confrontation that would help chart the course toward civil war. In Secession Debated, William W. Freehling and Craig M. Simpson have for the first time collected the seven surviving speeches and public letters of this greatest of southern debates over disunion, providing today's reader with a unique window into a moment of American crisis. Introducing the debate and debaters in compelling fashion, the editors help bring to life a sleepy Southern town suddenly alive with importance as a divided legislature met to decide the fate of Georgia, and by extension, that of the nation. We hear myriad voices, among them the energetic and self-righteous governor Joseph E. Brown who, while a slaveholder and secessionist, was somewhat suspect as a native North Georgian; Alexander H. Stephens, the eloquent Unionist whose "calm dispassionate approach" ultimately backfired; and fiery secessionist Robert Toombs who, impatient with Brown's indecisiveness and the caution of the Unionists, shouted to legislators: "Give me the sword but if you do not place it in my hands, before God I will take it." The secessionists' Henry Benning and Thomas R.R. Cobb as well as the Unionists Benjamin Hill and Herschel Johnson also speak to us across the years, most with eloquence, all with the patriotic, passionate conviction that defined an era. In the end, the legislature adopted a convention bill which decreed a popular vote on the issue in early January, 1861. The election results were close, mirroring the intense debate of two months before: 51% of Georgians favored immediate secession, a slim margin which the propaganda-conscious Brown later inflated to 58%. On January 19th the Georgia Convention sanctioned secession in a 166-130 vote, and the imminent Confederacy had its Southern hinge. 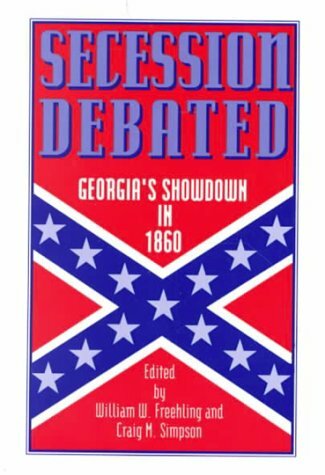 Secession Debated is a colorful and gripping tale told in the words of the actual participants, one which sheds new light on one of the great and hitherto neglected verbal showdowns in American history. It is essential to a full understanding of the origins of the war between the states. Georgia was the southernmost and last of the original thirteen colonies on the Atlantic seaboard. The survey line between Maryland and Pennsylvania, the work of two surveyors Mason and Dixon between 1763 and 1767, has come to represent the divide between the free North and the slaveholding South. The election was contested by four candidates who received electoral votes and the winner, Abraham Lincoln, had the lowest popular percentage in history. Following the election of Abraham Lincoln in November 1860, the principal southern states began to threaten and then to achieve secession before Lincoln's inauguration.